Friends, family and some of the world's most famous entertainers celebrated the life of Whitney Houston on Saturday, in a joyous funeral ceremony at the Newark church the New Jersey-born pop legend once called home. The soaring gospel singing of the New Hope Baptist Church choir, the Rev. Donnie McClurkin, the Rev. Kim Burrell and Bebe Winans filled the church with emotion that was both ebullient and mournful, as loved ones remembered the life and legacy of the talented and tragic superstar. "We are here today, hearts broken," the Rev. Joe Carter, New Hope's pastor, told the crowd. "But with God's strength we celebrate the life of Whitney Houston today ... 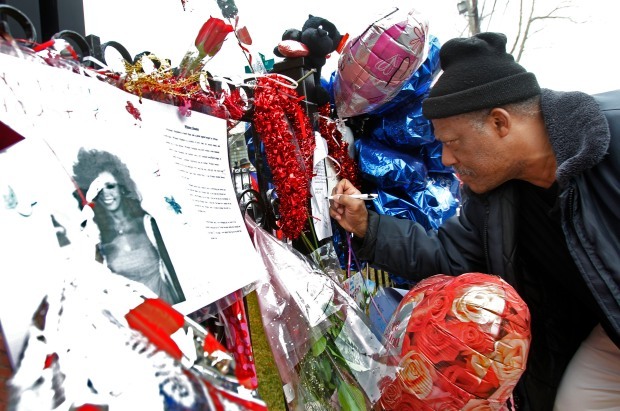 It is not about anyone but Whitney today." Kevin Costner recalled Houston as "beautiful as a woman could be," and Alicia Keys called her an "angel" and "a beautiful human" who made a whole generation of female singers "feel strong and capable and loved." The mayor of Newark spoke briefly at Whitney Houston's funeral at the New Hope Baptist Church Saturday. Stevie Wonder, R. Kelly and Alicia Keys paid musical tribute to Houston as Houston's cousin Dionne Warwick presided over the funeral, which was also attended by Oprah Winfrey, singer Brandy and her brother Ray J., Gov. Chris Christie, Tyler Perry, the Rev. Jesse Jackson, Cissy Houston and Whitney's daughter Bobbi Kristina. "There was a grace that kept on carrying her through," said Tyler Perry in a remembrance from the altar. "The same grace led her all the way to the top of the charts ... it was the same grace that carried her home." As Perry was speaking, Houston's mother stood up, clapping and raising her hands. Many churchgoers were also standing. Costner, Houston's co-star in "The Bodyguard," the film that cemented her superstardom and launched her signature song, "I Will Always Love You," recalled how Houston was plagued by great doubts despite her great gifts. 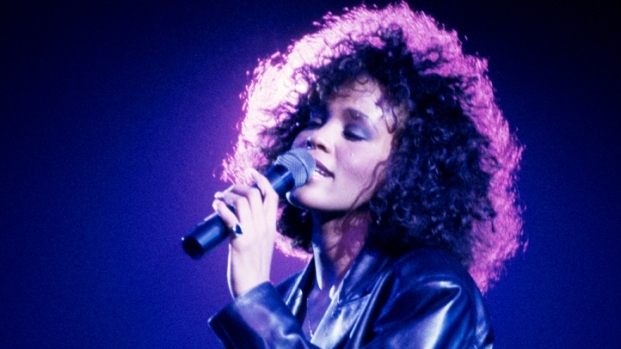 "Whitney, if you could hear me now I would tell you, 'You weren't just good enough. You were great. You sang that whole damn song without a band. You made the picture what it was,'" Costner said. "Off you go, Whitney," Costner said. "Off you go, escorted by an army of angels to your heavenly father. And when you sing before him, don't you worry. You'll be good enough." In his eulogy, the Rev. T.D. Jakes said that although "your tears may flow," love would save the day. "People that you love may leave you outwardly, but they will never leave you in inwardly," said Jakes, who added that he had just met Houston on the set of "Sparkle," a film that was to relaunch her acting career. "Love will last forever. For God is love." "You wait for a voice like that for a lifetime," said music mogul Clive Davis, who discovered Houston and shepherded her career for decades. Bobby Brown briefly appeared at the funeral as the service began. He walked to the casket, touched it and walked to the back of the New Jersey church. Security guards said that Brown would be seated, but the people he arrived with had to sit apart from him. Instead, Brown left, appearing upset. Earlier, mourners, including the Rev. Jesse Jackson, fell quiet a couple of hours before the service, as three police officers escorted in Houston's silver casket, draped with white roses and purple lilies. White-robed choir members began to fill the pews on the podium, and as the band played softly, they sang in a hushed voice, "Whitney, Whitney, Whitney." 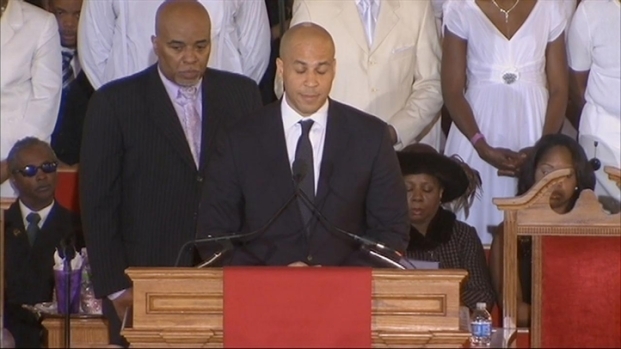 Newark Mayor Cory Booker addressed those assembled, assuring them that "God is in Heaven, and with him is one of our angels, Whitney Houston." Close family friend Aretha Franklin, whom Houston lovingly called "Aunt Ree," was expected to sing at the service, but could not attend because she was suffering leg spasms and needed to rest prior to her performance at Radio City Music Hall Saturday night. The service marked exactly one week after the 48-year-old Houston -- one of music's all-time biggest stars -- was found dead in a Beverly Hills hotel in California. A cause of death has yet to be determined. To the world, Houston was the pop queen with the perfect voice, the dazzling diva with regal beauty, a troubled superstar suffering from addiction and, finally, another victim of the dark side of fame. To her family and friends, she was just "Nippy," a nickname given to Houston when she was a child, one that stuck with her through adulthood and, later, would become the name of one of her companies. To them, she was a sister, a friend, a daughter, and a mother. "She always had the edge," Jackson said outside church Saturday. "You can tell when some kids have what we call a special anointing. Aretha had that when she was 14. ... Whitney cultivated that and took it to a very high level." "Just to celebrate her life, not just her death," said Brooks, "just to sing and dance with the people that love her." Others were more entrepreneurial, setting up card tables to sell silk-screened T-shirts with Houston's image and her CDs. But only the invited would get close to the church, as streets were closed to the public for blocks in every direction. Houston's death marked the final chapter for the superstar whose fall from grace, while shocking, was years in the making. Houston had her first No. 1 hit by the time she was 22, followed by a flurry of No. 1 songs and multi-platinum records. Over her career, she sold more than 50 million records in the United States alone. Her voice, an ideal blend of power, grace and beauty, made classics out of songs like "Saving All My Love For You," "I Will Always Love You," "The Greatest Love of All" and "I'm Every Woman." Her six Grammys were only a fraction of her many awards. But amid the fame, a turbulent marriage to Brown and her addiction to drugs tarnished her image. She became a woman falling apart in front of the world. Her last album, "I Look To You," debuted on the top of the charts when it was released in 2009 with strong sales, but didn't have the staying power of her previous records. A tour the next year was doomed by cancellations because of illness and sub-par performances. Still, a comeback was ahead: She was to star in the remake of "Sparkle" and was working on new music. Her family, friends and hard-core fans were hopeful. Houston is to be buried next to her father, John Houston, in nearby Westfield, N.J.